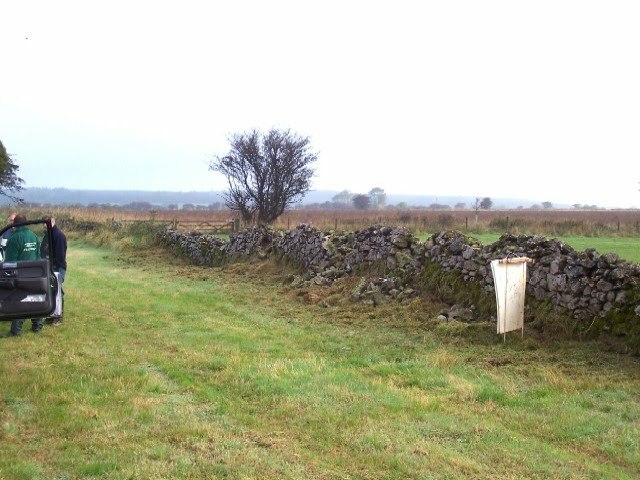 On a clear and mild day towards the end of last year I started a dry stone walling course in the Mendip hills in Somerset. From the shadow of Wells’ famous cathedral a steep road climbs the edge of a wooded combe to a small pastoral farm. 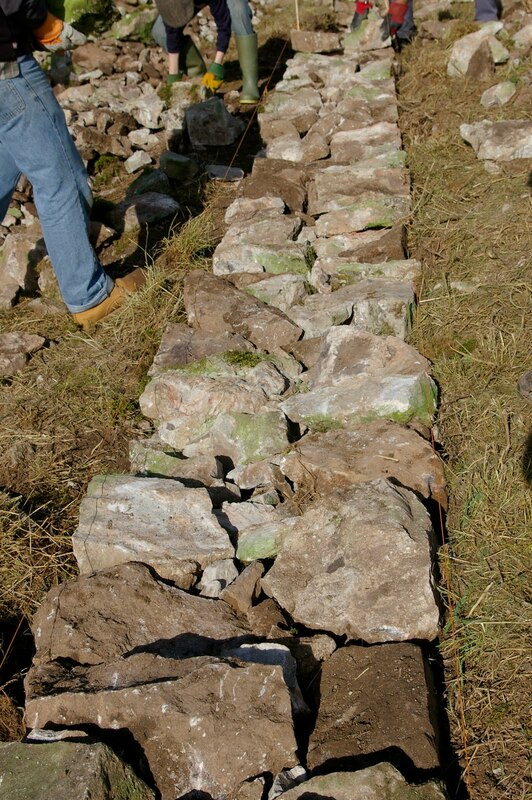 It’s here that a group of volunteers are guided through the process of re-building a wall. I was late. A brief introduction and I was put to work. The existing wall, how old no-one there can be sure, sags down on its broad base, visualising years of service. Throughout its existence this wall has been maintained by simply adding to the top. The wall has to be completely removed; deconstructed and laid out in a size-orientated fashion ready for immediate reassembly. Allsorts of treasures are uncovered including numerous perfectly preserved rabbit skulls. 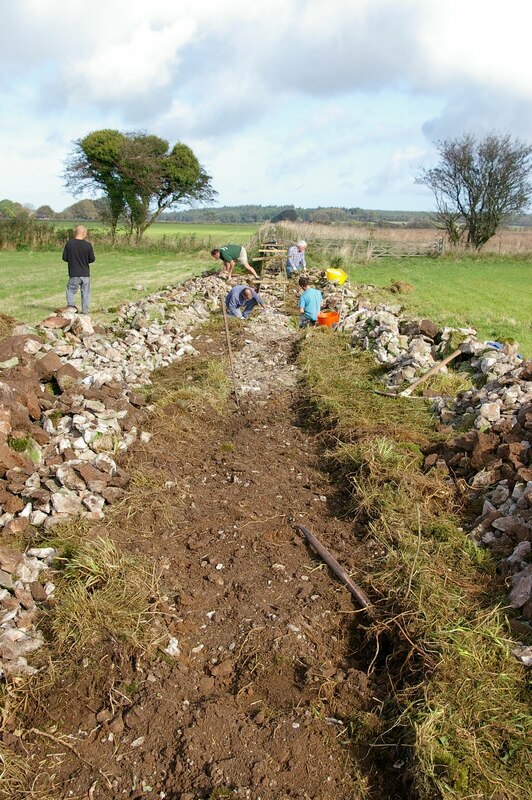 By the time the foundations are uncovered it has become clear to me what a backbreaking labour-intensive task this is and, not for the last time, I’m glad to be doing it as a modern day casual volunteer. In the 19th century I could expect to be making a shilling a yard if I was a decent enough waller, I suspect at my pace I would be unemployable. I chat with fellow volunteers; quite a cross section; farmers, a landscape gardener, retirees, members, me. Unexpectedly varying levels of enthusiasm too, one fellow appears to have been signed up by “the wife”. We reach ground zero and several A-frames are set up along the course of the wall with parallel lines running between as a guide to height and width. We work the whole section of the wall to this the line before it is moved up. I expect proficient wallers probably do this by eye. The Foundations go down, interlocking at the centre, two stones covering the width of the base. Naturally at this widest, lowest point the biggest stones are used and the aim is to create a base for the next layer, so the stones have to be surely planted, no rocking and a nice sharp outside edge, if anything sloping towards the centre of the wall. Some of thee foundation stones are huge and if you dismantled correctly they should be nearest the wall, at this weight one doesn’t want to be playing around with them too much. Much of this Limestone will have been quarried from the rich supply to be found locally but in many cases the stones have been dragged from the field to make it more suitable for ploughing. Any air pockets are pre-emptively filled with hearting. All the little stones and fragments up to about fist size are used as ‘hearting’ to ensure the wall is a tightly packed, solid structure. As we build higher, the volume made up of hearting becomes more substantial. This part of the process, previously unbeknownst to me, is absolutely crucial to the integrity of the finished wall. Despite this importance it seems to be perceived as the least glamorous job of the operation (every process has one). 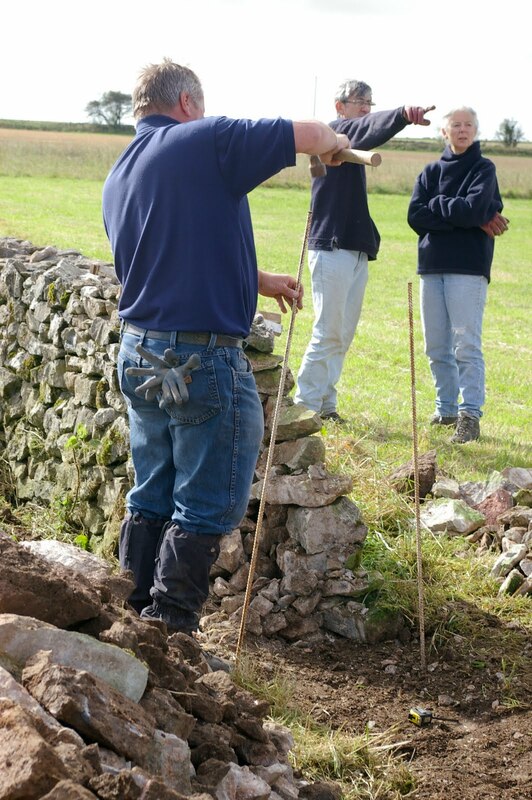 People are keen to get on with the main puzzle, the recognisable face of a dry stone wall and the hearting is often left for the more conscientious among us to fill in. 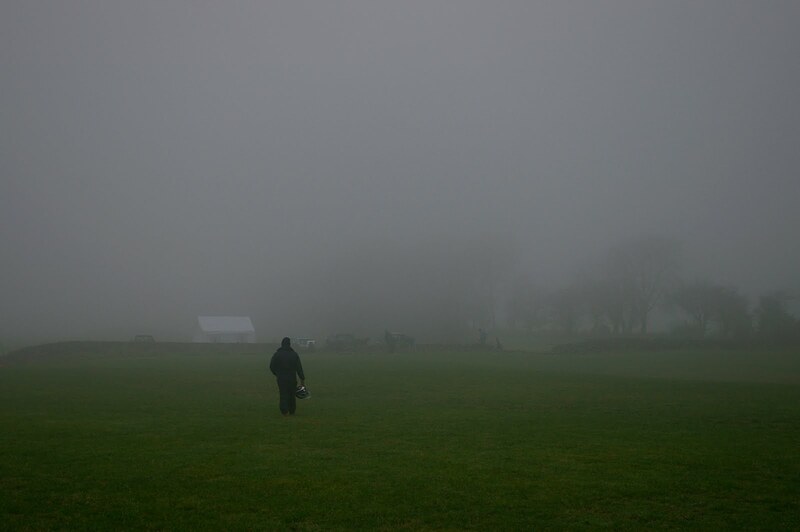 Resolves are tested from the off on the second day as, we make our way across a wet field, the mist only revealing the looming, incomplete task at the last minute. Unlike me, rain arrives early and sets in for the day. As we gain height and reduce our cache of building materials the mental challenge becomes more prevalent. The ongoing puzzle continues, essentially; finding a stone that will bridge the gap to the previous layer (ala typical running-bond brick wall), nestle right into position without any rocking and create as flat a surface to build from as possible. But more than that, at this stage frustration is never far away, with fewer and fewer stones available I continually find myself trying the same stone in the same position. At this point it seems to have become impossible to judge whether or not a stone will be appropriate without actually trying it in every conceivable orientation. Lunchtime and the rain continues unabated. There are only a few yards of wall left incomplete and the group is given the opportunity to abandon ship. Over half of our contingent leaves, some reluctantly, others not so. I decide to press on. Somehow I feel as though the weather sweeping over this particular Mendip hill adds to the authenticity of the experience. 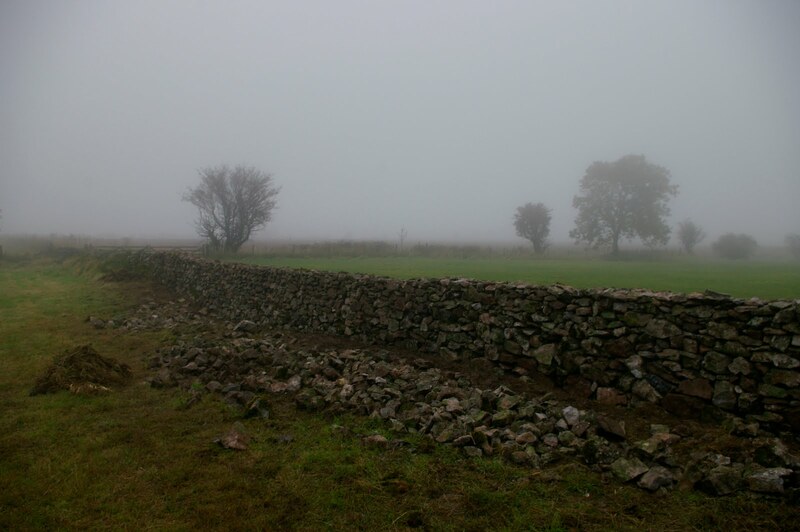 It is unsurprising that to see the completed wall is rather satisfying, however, when the last stone was laid and we stood back I was quite taken back by the sense of pride and achievement. No doubt this was partly due to the physical and mental input but I think it was also partly attributable to the iconic, if understated, nature of the subject in our British consciousness. Having been part of the building crew it’s hard to believe just how solid this structure is and not a single hammer or chisel left the back of the land rover throughout the course of the weekend. 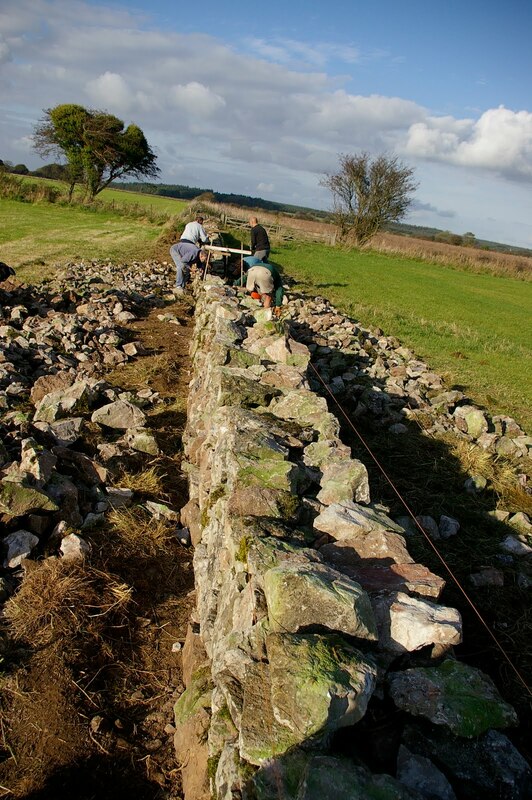 This particular method of walling is one for the purist, the stones are used unaltered and no pinning on the outside faces is permitted. Rising out of the earth, the wall modestly stops at the top, task complete. No flourish of vertical coping stones here. My contribution to the walls of Somerset is complete, I’m keen to do more but want to experience other regions. With some seventy thousand miles* of wall still available and only nine percent* of that reportedly stock-proof, there’s still plenty of work to be done.